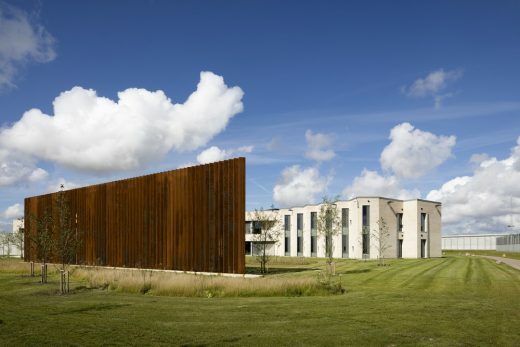 The aim of the closed Storstrøm Prison is to create the world’s most humane high-security prison, which contributes to the inmates’ social rehabilitation through architecture that supports the inmates’ mental and physical well-being and also ensures a secure and pleasant workplace for the prison staff. The overall architectural intent is to create a facility that echoes the structure and scale of a small provincial community. 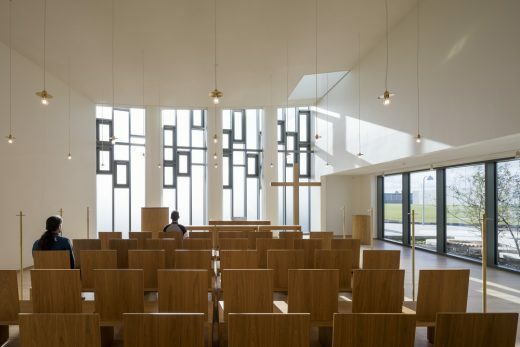 The result is architecture which stimulates the urge and ability to rejoin society after serving a prison sentence. 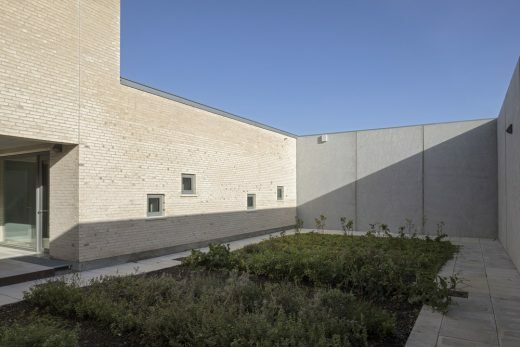 The architecture also creates a pleasant and secure environment for the prison staff, and is a natural element of the surrounding built-up area on Lolland Falster. 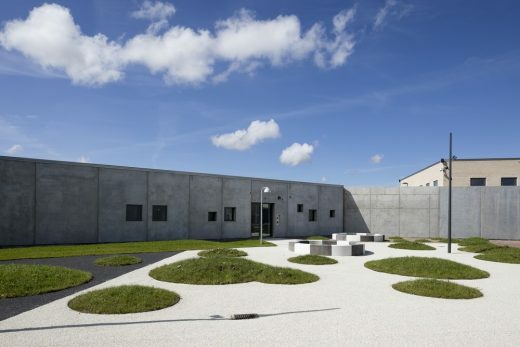 The prison accommodates 250 inmates in four standard prison wings and one maximum-security wing. 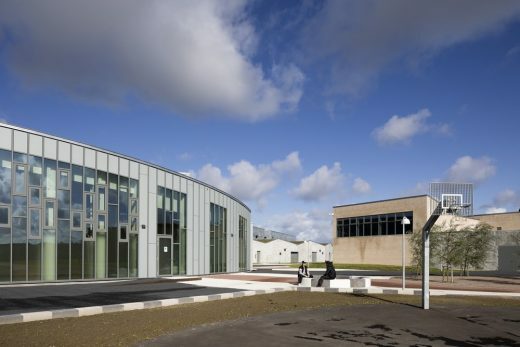 There is also a visitors’ unit, activity building, workshop building, gate building and staff building. The ten buildings in total cover overall floorspace of approximately 35,000 m². The prison buildings are located to form a small urban community, with streets, squares and centrally located community buildings. From the various urban rooms and cells there are views of the surrounding green landscape space up towards the encircling perimeter wall. 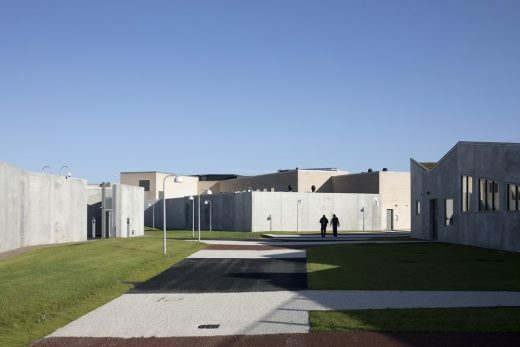 The perimeter wall is formed with a series of recesses, to give a varied and less imposing expression and to reduce the institutionalised atmosphere for the inmates. The inmates are free to practice their religion in the church or one of several devotional rooms. 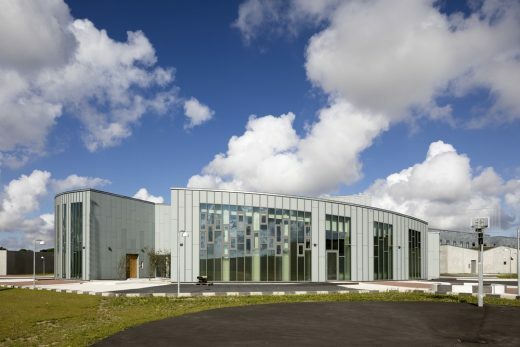 The buildings are designed with recessed facades and angular roof ridges, to minimise the institutionalised appearance. 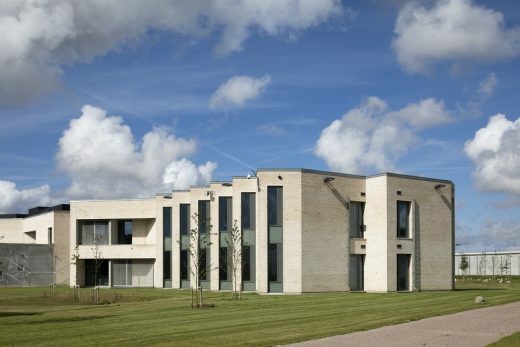 The facade materials alternate between light-coloured bricks and a composite material of concrete and galvanised steel. 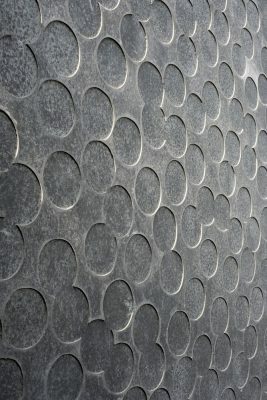 These are materials which age beautifully, requiring little maintenance. The five wings, as well as the visitors’ department and gateway building, are brick buildings. 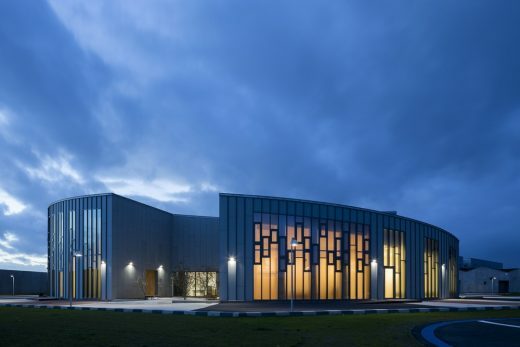 The activity building has concrete panelled and glass facing, and the workshop building has steel panel facing, combined with concrete. 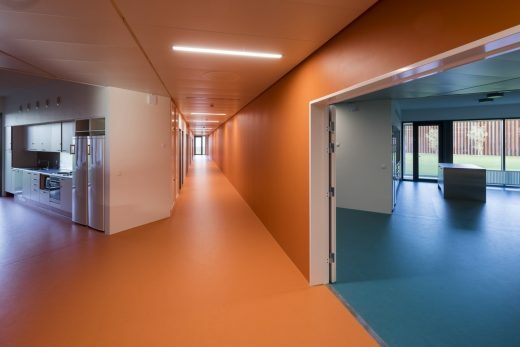 Inside the buildings, the colours used on walls and floors help to eliminate the institutionalised atmosphere. 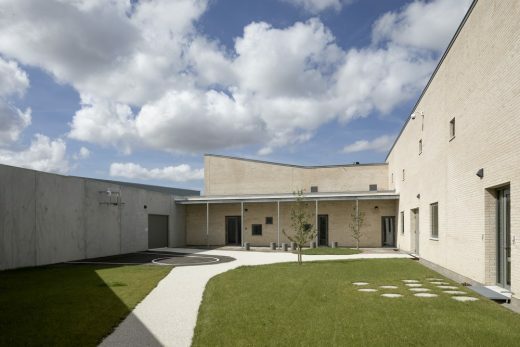 This is especially apparent in the communal areas, with opportunities for the inmates to relax and interact socially. The cells are in neutral colours, so that the inmates can decorate their cells as they wish. 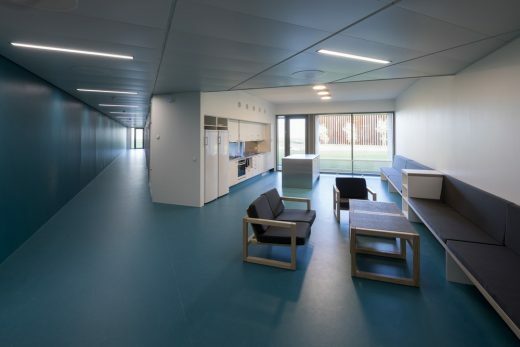 The cells are combined in residential units consisting of four to seven cells, with access to a living room area and a communal kitchen. Prisoners can cook for themselves and are essentially free to determine whether they wish to cook with others or on their own. 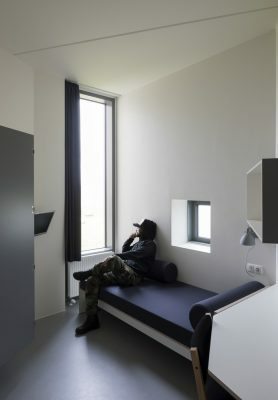 Daylight is known to be important for well-being and each cell has a flow of daylight from two sides, with views of the surrounding countryside and the sky, giving inmates a glimpse of freedom beyond the prison walls, from a small window, as well as a large window spanning the full cell height. 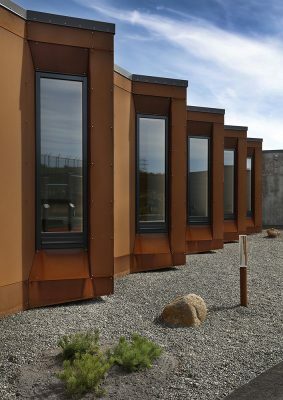 The windows are angled so that the inmates cannot look into one another’s cells, to prevent unwanted communication and also strengthen the sense of having a private life. 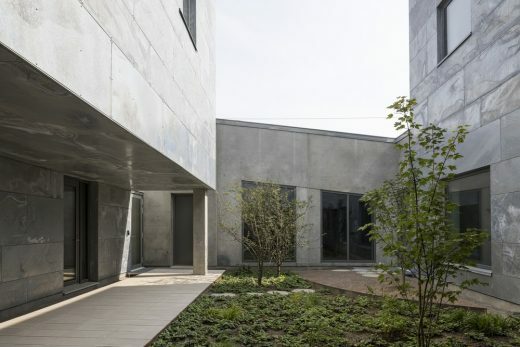 The 12.8- sqm cells, including toilet/shower units, are innovatively designed with curved walls, in contrast to cell’s overall angular expression, so that prison staff can view most of the cell from the door. Each cell has a bed, desk, chair, wardrobe, refrigerator, television and lighting. 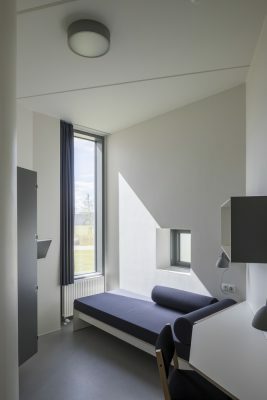 The furniture is designed specifically for the cells, so that the number of sharp corners is reduced in order to minimise the risk of self-harming and to ensure optimum use of the space, with views of the countryside outside the cell. 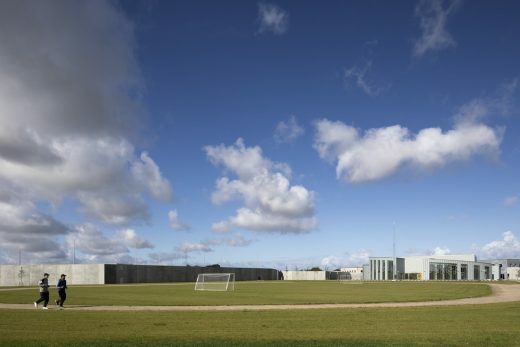 Physical activity is an important aspect of modern prison life, as exercise is known to have a positive effect on inmates’ mental and social well-being. 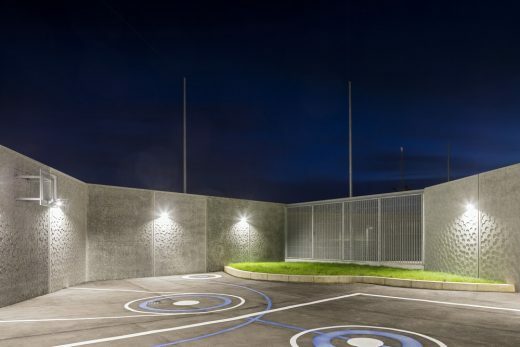 Clustering the buildings around the centre has left space for a seven-a-side soccer pitch and a running track in the landscaped area within the perimeter wall. 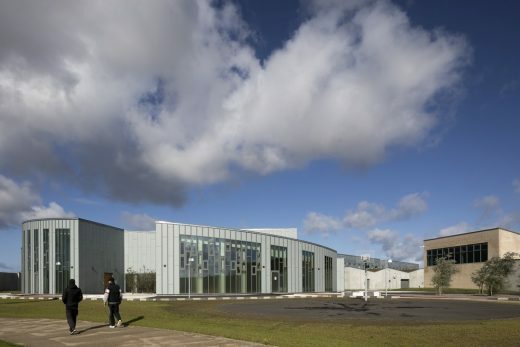 The activity building has a large indoor sports hall with badminton, basketball, soccer and handball courts. There are two small gym halls in the maximum security wing. Each cell department has its own fitness room. Both works of art and building-integrated decoration can be found in the prison. A large mural by John Koerner spans the full length of the prison’s large gym hall, while a bronze sculpture by Claus Carstensen is displayed in the urban space. 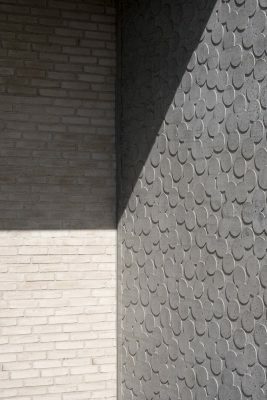 In several places, a circular pattern is used for varied embossment of the concrete element walls created by Aggebo & Henriksen Design, to break the otherwise monotonous surface. 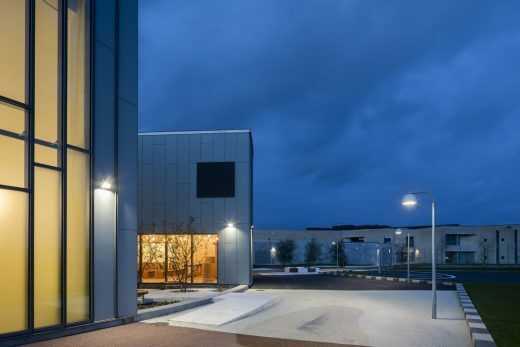 The four colours – yellow, orange, green and blue -that contribute to the positive atmosphere and variation in the buildings, and which are also used in the cell departments, have been defined in collaboration with Aggebo & Henriksen Design. 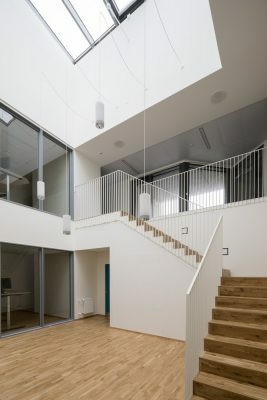 The architecture provides vantage points for prison staff, from which they can oversee a complete floor of a cell department, with a wide field of vision in several directions from central guardroom spaces. These spaces are also an obvious meeting place for inmates and staff. To safeguard staff safety, there are secure rooms and escape routes in the individual departments, so that staff can quickly assemble here and maintain the upper hand in the event of unrest among the inmates. The secure wing is used for negatively dominant and restricted status inmates. 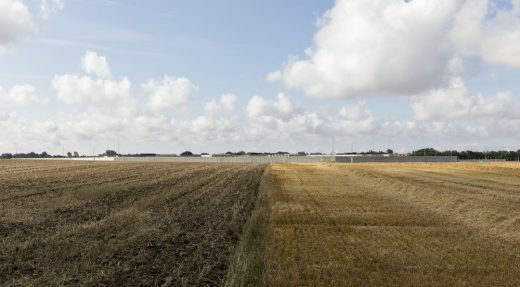 This unit is surrounded by a wall, and inmates and prison staff are physically separated. In other units, staff man an open desk. 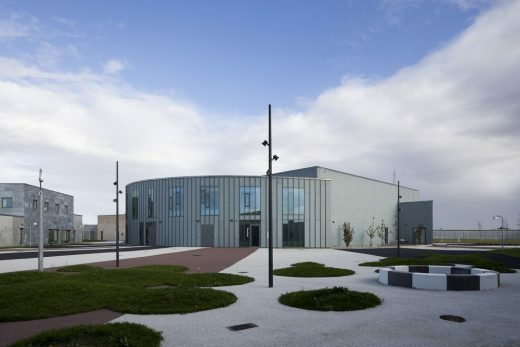 The architectural design has been used to create a flexible prison that can adapt to different categories of inmates and specific emergencies. This is achieved by making it possible to divide individual departments into larger and smaller sections. This helps to enhance security and provide good conditions for the social rehabilitation of prisoners in a secure environment.